The third largest island in the world, Borneo is also one of the most biodiverse areas on the planet; a place where you can experience luxury and nature beyond your wildest dreams. With true adventure on your doorstep, Borneo offers bright-white beaches juxtaposed with lush jungle that’s just begging to be explored. Having spent three months on this beautiful island, Flight Centre First and Business’s Kat Townsend can’t recommend it highly enough. It’s got incredibly friendly locals, unique wildlife, awe-inspiring scenery and of course, lavish, charming and eco-friendly hotels. 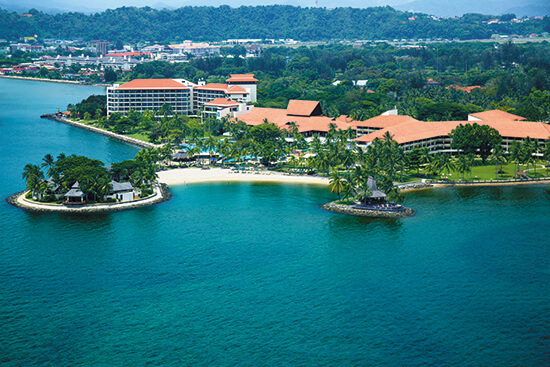 Located just 10 minutes from Kota Kinabalu, Sabah state’s capital city, Shangri-La’s Tanjung Aru Resort & Spa provides an idyllic setting for a tropical getaway. With lavishly decorated suites inspired by Borneo’s rich cultural heritage, coupled with naturally beautiful surroundings, you will soon wish you could stay there forever. The hotel boasts seven restaurants and bars, an atmospheric Sunset Bar and beach-side cabanas. It has all you need for a hefty dose of pure luxury and, if you need more of a reason to be tempted, there’s also abundant pampering to be had at the CHI Spa. Dubbed one of Borneo’s most luxurious hotels, Gaya Island Resort boasts 120 modern villas set amongst spectacular wildlife-spotting scenery. Expert guides are on hand if you fancy getting out of the hotel and into true Bornean wilderness, hoping to spot the elusive, endemic proboscis monkey. For some relaxation, head for the Spa Village, set in an authentic environment of intertwined mangroves. This resort is where jungle canopies effortlessly give way to the pure, white sand of the beaches. 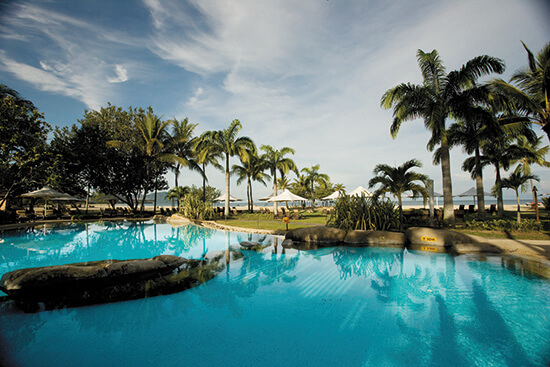 Some search for great Escapes, but what the Shangri-La Rasa Ria Resort & Spa offers is true paradise. Surrounded by 400 acres of tropical forest and set on a nature reserve, luxury doesn’t get much more adventurous than this. With horse riding, deep-sea fishing and the chance to come face-to-face with Borneo’s most famous resident at the easy-to-reach Sepilok Orangutan Rehabilitation Centre – just a short, 50-minute plane ride away – this resort has it all. After all of that, it would be criminal not to relax at the magnificent Spa at Dalit Bay or tee off on the hotel’s Championship golf course. Whatever you’re after on your Bornean getaway, the Shangri-La Rasa Ria has it all. Just off the coast of Borneo, set on a coral reef island, Bunga Raya Island Resort is a Robinson Crusoe-esque hideaway of 48 timbered villas. Hidden away on a tranquil bay, it is fringed by bright white sand beaches and set amid the jungle canopy. The villas range from simple dwellings, located right on the beach, to opulent three-bedroom, multi-level villas with sweeping outside decks and indulgent private plunge pools. For those really looking indulge, there’s also an exotic private spa pavilion set atop the hillside and offering breathtaking views of the silica below. Want to plan your luxury Escape? Speak to one of our Travel Experts today about booking your beach Escape. The Flight Centre First and Business team are our most experienced travel experts who specialise in booking premium airfares and arranging luxury holidays. They offer personal recommendations on the most amazing places to stay and will book you the best seat on the plane. For a tailor-made quote, speak to one of our dedicated premium travel experts today on 0800 082 5907.